A new course, “The Super Bowl and Society,” debuted in the College of Human Ecology this semester. With enrollment of more than 100 students, SPM 199 explores the evolution and strategic brilliance that has allowed a football game to become a social phenomenon with international audiences, business impact and cultural implications. Students in the class benefit from the expertise of a trio of SPM faculty who are actively engaged in teaching and discussions. Michael Veley is director and chair of the Department of Sport Management (and also serves as the Carrier Dome’s public address play-by-play announcer); Rick Burton is the David B. Falk Professor of Sport Management and worked for a sports marketing agency with experience on the NFL account, attending three Super Bowls during the mid-90s; and Dennis Deninger is an adjunct professor in the Department of Sport Management and the Newhouse School’s TV/Radio/Film Department who won three Emmy Awards as a producer working at ESPN for more than 25 years. 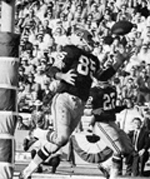 Super Bowl I did not sell out … the L.A. Coliseum was about 30 percent empty. NFL Commissioner Pete Rozelle came out onto the field before the game started and realized CBS’s cameras would see too many empty seats. So he instructed that announcements be made to move fans who bought the $6 tickets into more favorable locations. Rozelle didn’t like the title “Super Bowl,” so the first two Super Bowls were officially called the “AFL/NFL World Championship Game.” But for fans and the media, the game was the Super Bowl from the very beginning. Super Bowl I was aired live on both CBS and NBC. The second half kickoff came while NBC was still in commercial. So after the network complained, the referee actually allowed a “do-over,” and they kicked off again. Luckily, the first kick resulted in a touchback, and there had been no run back. For Deninger, the best part of the course so far has been opening students’ eyes to how much more than a game this annual event has become. “It has been the most watched television show in America each year for more than a decade, and because of its social, cultural, economic and political impact, Super Bowl Sunday has become as much a national holiday as any other official holiday on our calendar,” says Deninger. The faculty recruited a host of impressive guest speakers throughout the semester who are scheduled to include NBC’s Drew Esocoff, director of NBC Sunday Night Football, each of NBC’s recent Super Bowls and the Olympics; a Super Bowl reporter; a Super Bowl researcher; and possibly some Super Bowl players/coaches from Buffalo, or SU alums, who have played in the Super Bowl. “The class has been designed with notable rigor as it relates to understanding complex concepts that make this single football game such a touchstone for so many people. The TV production, the advertising, the spending, the history, the cinematic representation and the massive audience all make this a unique story for contemporary students,” says Burton. On Tuesday, Feb. 8, two days after Super Bowl XLV, the class will do a critical analysis of the game telecast, including commentary from Esocoff. The class will also review the Super Bowl advertising, the USA Today Ad poll, and project which stars may become the next major endorsers. The class just before the Super Bowl will focus on how to watch the Super Bowl and prepare students for the way the game will be directed/produced, the storylines that will likely get pushed (various league, network and sponsor agendas), the technology to be used and the camera coverage production aspect. “We’ve long known the Super Bowl plays a unique role in shaping contemporary American society. We felt our expertise and focus on sport management made this a logical class for SU students and the Falk Center to explore,” says Burton.